The overall score of the 2017 assessment of the foreign policy performance has improved. Among the positive results, one can clearly see the activation of the institutions that elaborate and implement the foreign policy in the priority directions. However, the strategic vision of the foreign policy development traditionally remains at low level. Therefore, it is not a surprise that the strategic vision issue is one of our recommendations key points. For the third year in a row now, the report provides a sufficient comparative basis for diplomats and foreign policy experts aimed at the comprehensive understanding of the foreign policy, its political, institutional and strategic components. 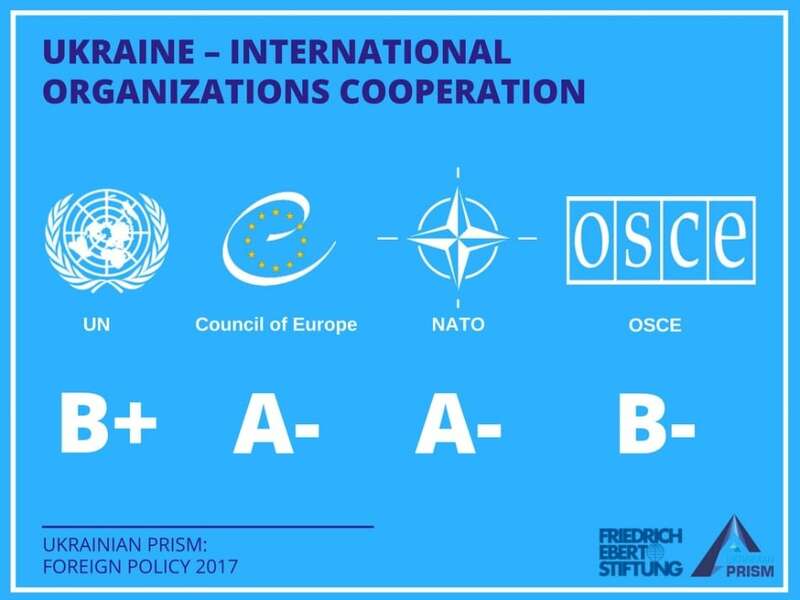 We believe that the “Ukrainian Prism: Foreign Policy 2017” report brought us one more step further in creation of a practical and objective tool for the Ukraine’s foreign policy assessment. Traditionally in this report, experts of the Foreign Policy Council “Ukrainian Prism” in partnership with the Regional Representation of the Friedrich Ebert Foundation in Ukraine analysed details of the Ukrainian foreign policy elaboration and implementation, as well as systematically evaluated its success according to the proposed scale. Every year we improve our methodology of evaluation and take into account results of the discussions held both in Ukraine and abroad. While preparing this year foreign policy assessment, we decided to expand it with some important geographical and functional directions. In such a way, the total number of the analysed foreign policy vectors reached 50. In 2017, compared with the previous years, political interest analysis demonstrated that the Ukrainian political actors were mainly focused on the foreign policy priority areas identified in 2015-2016. The foreign policy position of the President of Ukraine was summed up in his speech at the traditional annual meeting with the foreign ambassadors accredited in Ukraine (in January), as well as in the Annual Address of the President of Ukraine to the Verkhovna Rada “On the internal and the external position of Ukraine in 2017” (in September). These public statements allow identifying the priority areas of the foreign policy interest. In particular, the special emphasis was put on the protection of the territorial integrity of Ukraine, its European integration and belonging to the Euro-Atlantic civilization space. A creation of the international coalition to support Ukraine in its fight against the Russian aggression was also repeatedly mentioned as a foreign policy priority. European support in the security issues was tangible in relations with Austria, Germany, Lithuania, Poland, and France. The preservation of sanctions against Russia was a common denominator of the agenda, with the Ukrainian politicians emphasizing it on all international platforms. The European integration in the analysed year had its specific frames that needed a political support. . In particular, they concerned the full enactment of the Association Agreement, and an introduction of the visa-free regime for the Ukrainian citizens travelling to the EU. Implementation of the Association Agreement in the future also requires other forms of the strategic long-term cooperation. According to the President’s vision, people at the referendum should approve the Ukraine’s future membership in NATO. At the moment, the Euro-Atlantic direction, and the country’s compliance with the NATO standards have a high priority among other issues in the foreign policy of Ukraine. Most of the political actors in 2017, like in the previous years, defined the United States as a key partner and an ally of Ukraine in the political, security, economic and energy spheres. Traditionally intensive dialogue with Japan and Canada, strategic relations with Turkey and Azerbaijan were be noted, in particular, in the presidential statements. The head of the state also declared his interest in improving of the bilateral relations with the Middle East and Latin America countries. The medium-term Governmental Action Plan till 2020 is a political document describing the government activities aimed at the development of the Ukraine’s foreign policy priority areas. It postulates the need for such issues as the national legislation approximation to the EU norms, functioning of the deep and comprehensive free trade area between Ukraine and the EU, bringing the Armed Forces to the NATO standards, strengthening international trade and investment attractiveness of Ukraine as well. At the parliamentary level, it was managed to adopt a number of concerted political documents dedicated to the foreign affairs and the bilateral relations. In particular, in 2017, the following decisions of the Verkhovna Rada of Ukraine were adopted, all of them demonstrating the consolidated position of the various factions: “On the Appeal of the Verkhovna Rada of Ukraine to the parliaments of the foreign states and the international organizations concerning condemnation of the escalation of the armed aggression of the Russian Federation against Ukraine”, “On the Appeal of the Verkhovna Rada of Ukraine regarding the Final Report of the OSCE Office for Democratic Institutions and Human Rights (ODIHR) on the monitoring of the elections to the State Duma of the Federal Assembly of the Russian Federation in 2016”, and “On the Appeal of the Verkhovna Rada of Ukraine to the Congress of the United States on security guarantees”. In addition, some attention was paid to the cooperation with the EU and NATO, the human rights and the territorial integrity issues. In general, according to the results of the analysis, in 2017, the greatest political attention were divided between the following directions: relations with the USA, Canada, the EU member states and the organization at large, and Turkey, human rights protection, and the Ukraine’s activities within the Council of Europe and the UN. The institutional cooperation in 2017 slightly improved for the overwhelming majority of the foreign policy directions. In October, the Cabinet of Ministers of Ukraine announced a creation of the new Government Office for the Coordination of European and Euro-Atlantic Integration. The new provision was approved in the framework of the public administration reform and adopted by the Governmental resolution. The office is responsible for the coordination of the executive authorities’ activities aiming at the implementation of the Association Agreement between Ukraine and the EU, as well as for directing political, political-military dialogue and practical cooperation with NATO and its member states. The political level of the integration processes coordination was carried out by the Office of the Vice Prime Minister for European and Euro-Atlantic integration of Ukraine, as well as by the Ministry of Foreign Affairs of Ukraine. The economic diplomacy was strengthened by a number of coordinating institutions. As early as in January 2017, President Poroshenko announced the launch of the National Investment Council under the, President of Ukraine. In August, its Provision, and in October -members of the Council headed by the President were approved. The Prime Minister of Ukraine, the First Vice Prime Minister of Ukraine -the Minister of Economic Development and Trade, the Minister of Finance, the Minister of Energy and Coal Mining, the Minister of Infrastructure, the Minister of Justice, the Chairman of the Verkhovna Rada, the Head and the Deputy Head of the Administration of the President of Ukraine, and other persons joined the Council. The majority of the bilateral foreign policy directions remained under the responsibility of the MFA and the diplomatic missions abroad, though the dynamics of the Ukrainian officials’ visits shows the active involvement, in particular, of the Ministry of Defence, the Ministry of Justice, the Ministry of Infrastructure, the General Prosecutor’s Office and others. In order to implement the Strategic Trade Development Roadmap, the International Trade Council was created as a temporary consultative and advisory body of the Cabinet of Ministers of Ukraine. The Council should facilitate coordination of the central executive bodies to support the exports growth and the international trade procedures simplification. The Council is headed by the First Vice Prime Minister of Ukraine – the Minister of Economic Development and Trade, with some deputy ministers, heads of the Parliamentary committees and others taking part in its work. At the same time, despite the plans for 2017, the launch of the Export Credit Agency failed. The Export Promotion Council and the Export Promotion Office under the Ministry of Economic Development and Trade, as well as the Exporters and Investors Council under the Ministry of Foreign Affairs, were rather active. . The meetings of the Ukrainian part of the bilateral intergovernmental commissions on trade and economic cooperation, as well as working groups on the organization of the bilateral economic forums added a lot to the coordination efforts at the national level. In June, the Cabinet of Ministers of Ukraine established the Interagency Commission on the Popularization of Ukraine in the World, formed with the governmental and non-governmental structures representatives. From the moment of its creation, the commission managed to hold a number of thematic meetings about the creation of the brand of Ukraine. The public councils under the ministries and agencies were re-elected, allowing to strengthen the cooperation of the relevant ministries with non-governmental organizations and to raise the expert consultations level. At the end of the year, the MFA of Ukraine developed a procedure for the Ukrainian independent experts’ secondment abroad to participate in thematic public events, while strengthening the public and expert diplomacy. Supported by the Public Council under the Ministry of Foreign Affairs, a list of the well-known expert platforms was prepared, where it was advised to facilitate the Ukrainian representatives’ participation. However, it should be also noted that there was a certain coordination imbalance between the governmental structures and the parliament, causing several internal discussions (for example, on the draft law No. 7206 “Buy Ukrainian, Pay to Ukrainians“) and misunderstandings with the neighbouring states (Article 7 of the Law of Ukraine “On Education”). The cooperation between the executive and legislative branches of power on the implementation of the Association Agreement remained extremely low, resulting in a considerable fall behind the schedule of the legislative support and the agreement implementation. The lack of a coordinated approach, unfortunately, was a characteristic feature when considering the important law “On Diplomatic Service”, which was supposed to reboot the work of Ukrainian diplomacy according to realities and needs of the time.
. The working group, chaired by B. Tarasyuk, the Deputy Chairman of the Committee on Foreign Affairs of the Verkhovna Rada of Ukraine, in a period of November 2016 – June 2017, substantially polished the original draft prepared by the MFA. However, further handoff of the document to the President of Ukraine slowed down the process for almost six months, and the law was adopted in the first reading only in December 2017. The exclusion of a norm regarding consultations with the profile parliamentary committee members on the candidates of the heads of the Ukrainian diplomatic missions abroad became a specific feature of the presidential version of the Law of Ukraine “On Diplomatic Service”. According to the authors of this study, the relations with the USA, the EU, NATO, the Council of Europe, as well as a sphere of human rights protection can be distinguished as the most coordinated foreign policy directions at the national level. Until now, there is any generalized conceptual vision. The guidelines for the foreign policy and the international security of Ukraine are defined in a number of the strategic documents. These documents are the Coalition Agreement, the National Security Strategy of Ukraine, the Military Doctrine of Ukraine, the Sustainable Development Strategy for Ukraine by 2020, the Association Agreement with the EU, the IMF Memorandum, the Charter on a Distinctive Partnership between Ukraine and NATO, the National Human Rights Strategy of Ukraine, the National Action Plan for the implementation of the UN Security Council Resolution 1325 “Women, Peace, and Security” for the period until 2020, the Concept of Ukraine’s popularization in the world and promotion of Ukraine’s interests in the global information space. In 2017, a number of documents and programs that could be classified as the framework-strategic or operational, developed to meet the existing strategic requirements, were adopted. In February, the Doctrine of Information Security of Ukraine was adopted, and in July, the Energy Strategy of Ukraine until 2035 was adopted too. Both documents form and refine in parts some principles of the foreign policy and security elaboration and implementation. Medium-term Governmental Action Plan till 2020 adopted April 3, 2017, consist of some tasks and events in the sphere of economic and energy diplomacy, European and Euro-Atlantic integration. In December, the Government approved the Export Strategy of Ukraine – the Strategic Trade Development Roadmap for 2017-2021. The Action Plan for the Roadmap implementation defines 56 tasks, involving about 40 state and non-state institutions, some of them still to be created. The Association Agreement between Ukraine and the EU also became an important strategic document, introducing the DCFTA and the AA implementation plan. In October, the Government approved a plan of the AA implementation, with 2016 tasks and about 5000 activities, in line with the Governmental Action Plan, strategic documents on the sectoral reforms, including the EU-agreed roadmaps. In the context of the Euro-Atlantic integration, it is necessary to mention the adoption of the Concept on improving the public awareness of Ukraine’s cooperation with NATO for the period 2017-2020 (in February). At the operational documents level, in June, the Cabinet of Ministers of Ukraine approved the Plan for the implementation of the Concept of Ukraine’s popularization in the world and promotion of Ukraine’s interests in the global information space, adopted in the end of 2016. The Public Diplomacy Division of the MFA of Ukraine is developing the Public Diplomacy Strategy. At the regional and bilateral level, there are some initiatives that can contribute to the establishment of the strategic or privileged partnership. For example, the Joint Statement of the Prime Ministers of Ukraine, the Republic of Estonia, the Republic of Latvia and the Republic of Lithuania, adopted in April 2017 can be considered as a strategic reference point for the relations between Ukraine and the Baltic states. A number of medium-term intergovernmental action plans for 2017-2019 and 2017-2020 (with Turkey and Belarus) indicates the formulation of a multi-year planning horizon. The strategic character is also observed in the thematic orientation of the Ukraine – PRС Action Plan on the implementation of the “Economic Belt of the Great Silk Road” and the “Sea Silk Road of the XXI Century” joint development. At the same time, in the majority of the analysed foreign policy areas, there are any mentions of the existing strategic documents of Ukraine, as well as the medium-term bilateral documents, that could fully represent the Ukrainian goals and interests in a separate vector of the international relations. Traditionally, this indicator of the foreign policy implementation gets the highest scores among others. However, in 2017, it will be fair to note grow in activity of almost all Ukrainian actors engaged in the foreign policy. In the context of the Russian aggression against Ukraine, the effective communication with the key partner countries of Ukraine, meaning the North America and the EU countries, as well as work in the framework of the United Nations, the OSCE, the CoE, and cooperation with NATO, gained its importance. The main tasks include the following: support of the territorial integrity of Ukraine, condemnation of the armed aggression against Ukraine, non-recognition of the illegal annexation of Crimea, prolongation and strengthening of the sanctions policy against Russia, pressure on its leadership to implement the Minsk agreements, protection of the rights of the Ukrainian citizens in the occupied territories, launch of the UN peacekeeping operation in the Donbas region. In this context, it is worth pointing out the high level of the foreign policy activity of the President of Ukraine, who tried to keep these issues on the agenda of his official and working visits abroad and to the international organizations, as well as while accepting his foreign colleagues in Ukraine. The successful contacts at the highest level (with the US, the EU, the UK, Canada, Turkey, and the Baltic states) matched with the enhanced contacts between the governments’ heads, and the intergovernmental level meetings, including MFAs. In the context of the international security and territorial integrity, the Minsk agreements remained to be the main mechanism for the Russia – Ukraine conflict settlement. In addition, the Ukraine’s activity within the international institutions framework was aimed at focusing of the international community’s attention (in particular, the UN, the International Court of Justice, the OSCE, the Council of Europe) to this issue. In February 2017, under its presidency in the UN Security Council, Ukraine managed to draw attention to the conflicts in Europe. The Ukrainian high-rank officials took part in a great number of the UN Security Council meetings in New York. In particular, the President of Ukraine took his part in the 72nd session of the UN General Assembly opening and in the UN Security Council high-level meeting on the reforms of the UN peacekeeping operations (in September). The international platform “Friends of De-occupation of Crimea“, initiated by the President of Ukraine in 2017 during the UN General Assembly, became important in terms of coordinating efforts in the Crimean issue resolution. 2017, compared to the previous period, can be considered as a year of the enforced and productive relations between Ukraine and the EU, since the mutual attention of Kyiv and Brussels to each other was at a high level. The President of Ukraine paid a visit to the capital of the EU twice (in June with a bilateral visit, and in November to take part in the 5th Eastern Partnership summit). The Prime Minister of Ukraine also paid two visits to Brussels (in February and December). In addition, the Ukraine – EU summit, which took place on July 12-13, 2017 in Kyiv, attracted a lot of attention. The Ukraine’s cooperation with NATO was active at all levels. In July 2017, an appointment of V. Prystaiko as the Head of the Mission of Ukraine to NATO became an extremely important development, since it confirmed the seriousness of the Ukraine’s intentions in regards to the further rapprochement strategy. The NATO – Ukraine Joint working group on the defence and technical cooperation took its regular meetings. Another important political step was the NATO – Ukraine Commission meeting in Kyiv, with the participation of the NATO Secretary General and the President of Ukraine (in July). The cooperation at the parliamentary level was equally active. The economic diplomacy also gained its momentum. In the context of cooperation with the EU and in the framework of the Association Agreement implementation, a number of the bilateral meetings were held: the High-level Ukraine – EU dialogue in horizontal and specific industrial sectors (in March), the first meeting of the EU – Ukraine Subcommittee on trade and sustainable development (in May), the 4th meeting of the EU – Ukraine Association Council (in December). During the year, negotiations with Turkey and Israel to reach the free trade agreements were held. There were a number of bilateral (with Albania, Hungary, Belarus, Lithuania, and South Korea) and international economic forums (with Canada and Georgia) with the participation of the Ukraine’s leadership. The joint intergovernmental commissions (in particular, with Moldova, Belarus, Vietnam, and Saudi Arabia) were also rather active. With some partners, such work has been renewed after a long break (Poland, China), while others agreed to set up the joint commissions (Albania, Qatar, Colombia). In June, the Cabinet of Ministers approved a decision on the establishment of a state body – “Ukrainian Institute”. Its branches were planned to be opened in 2017 in four European capitals (Warsaw, Berlin, Paris, Rome), but due to the complicated process of the interinstitutional approval, the implementation of this task was slowed down. In 2017, initiated by the Public Diplomacy Division, about 200 various projects in the field of public and cultural diplomacy were implemented. The parliamentary diplomacy strengthening should be emphasized separately. In May, the Verkhovna Rada approved the recommendations of the parliamentary hearings on “Current Issues of Ukraine’s Foreign Policy” (held in December 2016). In October, the joint parliamentary committees hearings on the implementation of the Annual National Programme under the aegis of the NATO – Ukraine Commission and the Strategic Defence Bulletin of Ukraine. The Committee’s on Foreign Affairs public events were dedicated to the elaboration of the Ukraine’s foreign policy strategy, energy security, economic diplomacy, and foreign policy dimension of the Donbas reintegration strategy. Under the aegis of the relevant committee on foreign affairs, 90 parliamentary groups developed the inter-parliamentary relations with the foreign countries’ parliaments. In 2017, the parliamentarians initiated creation of the parliamentary friendship groups with Ethiopia, Iceland, Colombia, Liechtenstein, Macedonia, Malaysia, Malta, Nigeria, South Africa, and Tunisia. Some legislative initiatives led to the bilateral relations deterioration with a number of neighbouring countries (for example, Hungary, Romania). In general, the study indicates the most intense official and informal events and contacts in the following directions: the United Kingdom, Canada, and the USA, economic cooperation with the European Union, Eastern Partnership, Euro-Atlantic integration, Lithuania, Poland, Baltic States, the UN, Council of Europe, human rights protection, and public diplomacy. 2017 became a year of further development of the international support provided to Ukraine in its counteraction to the Russian aggression, including the sanctions packages, with both personal and sectoral restrictive measures against Russia and its business and political elites expanded, strengthened and prolonged by the EU, the US, Canada, and other partners of Ukraine. To the Crimea annexation anniversary, the European Parliament adopted a resolution “On the Ukrainian prisoners in Russia and the situation in Crimea”. The international courts brought Russia to justice, that was also positive for Ukraine. On April 19, the International Court of Justice delivered its order on the first provisional measured in the case of Ukraine v. Russian Federation. In July, the documents, adopted at the OSCE Parliamentary Assembly session in Minsk, in particular the resolution “On the restoration of Ukraine’s sovereignty and territorial integrity”, once again condemned the fact of the Russia’s armed aggression against Ukraine, the temporary occupation of the Autonomous Republic of Crimea and the city of Sevastopol by Russia, and called on the Russian Federation to cease the hostilities in Ukraine. In May, the Committee of Ministers of the Council of Europe, in its decision on the situation in the ARC and Sevastopol (Ukraine), recognized the Russia’s responsibility in accordance with the International humanitarian law and international human rights law, and called on the Russian Federation authorities to fulfil their obligations and to stop repressions. The Permanent delegation of the Verkhovna Rada of Ukraine to the PACE had a success with extending the sanctions imposed by the Assembly on suspension of the Russian delegation to the PACE rights until the end of 2017. During the Parliamentary Assembly of the OSCE, the resolution “On the restoration of Ukraine’s sovereignty and territorial integrity”, proposed by the parliamentary delegation of Ukraine and containing provisions on human rights protection in the occupied territories, was approved as well. 2017 was a fateful time in the history of the Ukraine – EU relations, since they achieved both AA final ratification and its coming into force, as well as a visa-free regime for the Ukrainian citizens. However, the progress was to a certain extent overshadowed by the final text of the Eastern Partnership summit declaration, as well as the EU refusal to grant Ukraine a third tranche of EUR 600 million because of its failure to comply with the four pre-agreed requirements. In the context of relations with the United States, the adoption of the Countering America’s Adversaries through Sanctions Act, as well as the US active sanction policy became another important achievement of the year. Under the Trump administration, the US – Ukraine cooperation in the security and defence sphere found its new forms. K. Volker was appointed as the United States Special Representative for Ukraine Negotiations, responsible for the coordination of the interaction with Ukraine in order to accelerate the progress under the Minsk agreement. In addition, within the US budget limits for 2018, they allocated $350 million for the security assistance and providing defensive lethal weapon to Ukraine. The co-operation with the Western partners (the USA, the United Kingdom, Canada, Lithuania, and Poland) in the defence and security spheres also had its steady development. The Orbital, a British training program for the military personnel, was prolonged until March 2018. Canada decided to continue its military training mission UNIFIER until 2019, and Ukraine joined the Automatic Firearms Country Control List, which grants sale or supply of firearms to its member states. Despite the specific nature of the Turkey – Russia relations, the Turkey – Ukraine relations gained positive dynamics. In particular, in October, with the mediation of Turkey, Russia released imprisoned in the annexed Crimea the Deputy Chairmen of the Mejlis of the Crimean Tatar people A. Chiogoz and I. Umerov. During the Prime Minister V. Groysman visit to Turkey, the Turkish side sent a note on the prohibition for the Turkish vessels to visit the occupied Crimea. Nonetheless, the violations did not stop. The Ukraine-Baltic Forum of the Heads of the Governments in April became another significant event. The Joint Final Statement of the Prime Ministers of Ukraine, Estonia, Latvia, and Lithuania, dated April 6, 2017, declared the support for the territorial integrity of Ukraine, the condemnation of the Russia’s aggression against Ukraine, the encouragement for the further assistance to Ukraine, from the EU and NATO, in particular, as well as the support of the Euro-Atlantic course of Ukraine, the AA ratification, and a visa-free regime launch. The active economic diplomacy resulted in the Ukraine – Canada free trade area launch on August 1. Also, the European Council decision, dated June 28, 2017, on the extension of the three-year EU quota for the duty-free import of a number of products from the important sectors of the national economy, can be considered a success too. In May, Ukraine was officially invited to join the Pan-Euro-Med Convention. The internal procedures continued till the end of 2017, however, since May, Ukraine participated in the working bodies of the Convention as an observer. In January-November 2017, the volume of the Ukrainian goods export equalled $39.5 billion, with an increase of $6.8 billion, compared to the same period in 2016. In geography terms, there was a raise in goods export to Australia and Oceania – by 304.4%, America – by 59.8%, Europe – by 30.4%, the CIS – 15.6%, Asia – by 12.9%, and Africa – by 7.5%. At the same time, within 11 months of 2017, the main partners’ shares in the Ukrainian goods’ trade turnover were as following: the EU countries – 41.3%, China – 8.4%, Turkey – 4.0%, and the USA – 3.6%. The 2017 most successful directions are: the USA, the United Kingdom, Canada, Japan, Lithuania, the political dialogue with the EU, the Euro-Atlantic integration, Saudi Arabia and the UAE, the UN, the Council of Europe and human rights protection, and a visa-free regime. In 2017 relations with Great Britain remained very dynamic with numerous visits, continued support along all the key lines of cooperation, including support for Ukraine in conflict with Russia, security and defense cooperation and involvement in domestic reform processes. Attempts at determining the relations after Brexit were made but they were insufficient and were moved over as objective for 2018. In 2017 the Government of Italy continued supporting the European integration strivings of Ukraine and promoted achievement of peace in the East of the country, preservation of its territorial integrity, reinforcing intensified exchange of experience of countering RF’s hybrid aggressions, not recognizing the annexation of the Crimea. At the bilateral level inter-parliamentary and economic cooperation has been intensified. Security, military and medical as well as cultural cooperation is remains an important dimension. In 2017, the Ukraine-Canada relations gained their further development and were marked by the intensification in the economic, security and defence spheres. The continuing support provided by Canada in counteraction to the Russian aggression, its assistance in improving Ukraine’s defence capabilities remained of a great importance. Besides that, several high-level official visits provided a powerful impetus to the bilateral relations, which can be characterized as a special partnership. In 2017, the dialogue intensity between Ukraine and Germany significantly lost its dynamics, among others within the framework of the Normandy Format negotiations on the settlement of the situation in the Eastern Ukraine. The parliamentary elections, which took place in Germany in September and complicated processes within the EU, were last but not the least reasons for that. The level of the efficiency also went down in terms of bilateral agreements and joint activities. Though, the German financial and humanitarian support to Ukraine remained substantial. For the first time in the post-war history of the both countries, the Bundestag held hearings on the Germany historical responsibility towards Ukraine. The beginning of 2017 was marked by the expectation of newly elected US President Donald Trump’s position regarding Ukraine in general and the Ukrainian-Russian conflict in particular. To prevent “the Ukrainian question” from being moved to the back burner of the new US administration, Ukraine has enhanced institutional cooperation and intensified activities in relations with the USA. As a result, 2017 became a year of an active dialogue between the countries. The Ukrainian diplomats’ efforts were primarily directed at the extension of sanctions against the Russian Federation, maintaining security guarantees and providing defence weapons. Support of sovereignty and territorial integrity of Ukraine remained the central topic of high profile discussions. The year 2017 in Ukrainian-French relations was marked by electoral campaigns in France.Their results could have changed existing relations completely. This did not happen, and the current dynamics continued, yet structural problems remained. Lack of progress in conflict resolution mechanism, absence of strategic vision of bilateral relations and new priorities in French foreign policy pose additional challenges for Ukrainian diplomats. Political interest of Ukraine in Japan rose considerably in 2017, however, that did not improve institutional cooperation or strategic vision. Ukraine further considers Japan to be a priority partner, though, in the capacity of a donor with the possibility to increase own investment attractiveness in energy efficient projects, use of renewable energies, medical sphere development, etc. In 2017, the Ukraine's relations with the EU got second wind due to the Association Agreement coming into force and introduction of a visa-free regime. By the end of the year, however, the relations were a bit undermined by the EU's refusal to grant a third, last tranche of EUR 600 million due to the Ukraine's default on its commitments. In spite of an assessment being positive in general, one can notice some fatigue and disappointment over the reforms stagnation in Ukraine, and consequently, the reluctance of the EU member states to pay a high price for breaking relations with Russia following previously imposed sanctions. In 2017, there were no fundamental changes in the economic cooperation with the EU. Neither the Ukraine – EU Summit, nor the Eastern Partnership summit achieved any breakthrough. At the same time, the EU – Ukraine Association Agreement finally came into force. The ongoing process of rapprochement with the EU regulatory also continues, being criticized for the slow speed and a level of transformations. The Ukrainian trade reorientation to Europe also experiences some intensification combined in absence of changes in the sphere of investments attraction. The main political event for Ukrainians and simultaneously the key achievement of foreign policy in 2017 was the launch of visa-free regime with the countries of the Schengen area. Yet, despite the successful start, closer to the end of the year the balance of responsibility between citizens of Ukraine and the government regarding compliance with visa-free rules and the mechanism for its temporary suspension has been violated by government officials. While citizens of Ukraine were complying with visa-free travel requirements, the attempts of government to weaken independence of anticorruption institutions together with violation of anticorrpution liabilities have caused a number of warnings and concerns on the part of the EU and certain member-states regarding regress of the reforms initiated as part of visa liberalization. The very situation has again brought up the issue of post-visa monitoring of the compliance with Visa Liberalization Action Plan. The year 2017 was marked with fierce fight between energy monopolists and proponents of energy sector reform. Due to pressure from Energy Community Secretariat, the European Commission and international partners, the Law on electrical energy market, commercial accounting of heat energy and water supply, energy efficiency of buildings was adopted, as well as Energy Efficiency Fund; also the Energy Strategy of Ukraine 2035 was presented. At the same time, reformers had to make significant concessions, which in return decreased the quality of adopted legislation, namely regarding national regulator in energy sector. In 2017, it became possible to slow down the implementation of Nord Stream 2 project, yet not the same with Turkish Stream, which remains a threat for the decrease of gas transportation after 2019 and a new wave of gas confrontation with Russia. The issue of cooperation with NATO remained the key one in foreign and security policy of Ukraine in 2017. Codification by law of Ukraine’s future membership in NATO and development of the Annual National Program by the new standards were important steps. Activities at all levels – presidential, ministerial and parliamentary ones, as well as constant contacts at the highest level and continuous support provided by the Alliance is a sustainable trend. 2017 showed that despite reduced trust in the Ukrainian political elites, international support of Ukraine is still there. Regardless of ungrounded fears, the territorial integrity of the Ukrainian state has not been subjected to compromises among the key world actors, a “great agreement” between the Western partners and Putin’s Russia “at the expenses of Ukraine” has not been arranged. Unlike the previous year, the threat of lifting or relief of sanctions against Russia was considerably neutralized. Instead, during 2017, the sanction package was expanded and reinforced, while in the international package of support for Ukraine there appeared new military and strategic components. Of utmost importance there still is the role of international organizations in the consolidation of international support to be provided to Ukraine. In 2017, certain positive achievements were made in economic diplomacy as compared to the previous year. Institutional development continued, and strategic vision was reinforced – the National Export Strategy of Ukraine was adopted. The Government carried out purposeful policy of introducing or restoring trade and economic as well as investment cooperation with China, India, Western Balkans and the Middle East countries, along with the European direction advance. Some economic diplomacy tools got political support from the President and the Prime Minister of Ukraine. In 2017, the overall volume of export increased slightly, what may prove that the country is about to leave the drastic decrease phase, which has lasted since 2013-2014. Still, so far the figures of export activity are still too low to be able to talk about reaching the level before the crisis. In 2017, both the Ukraine's foreign policy towards Georgia and the Ukrainian-Georgian bilateral relations received a new impetus. Due to the active cooperation on a wide range of issues, both countries confirmed interest in development of the bilateral relations towards the European and Euro-Atlantic integration. In 2017, the cooperation with Israel was aimed primarily at the implementation development of the inter-sectoral cooperation potential aiming for the creation of an FTA (which remains a priority task), as well as it was active in the medical, educational, legal, and cultural spheres. Despite the Ukrainian side’s statements on about the strategic character of the relations with Israel, this status is not documented. Though at the intergovernmental and inter-parliamentary levels the efforts were rather active, the overall degree of the political interest scaled back compared to the previous year. There is still a great potential for using the Israeli experience in the development of the economy, the military sector and the system of public administration in a context of continuing threats to the national security. Despite the low level of the officially declared interest in Iran, Ukraine pursued a rather active policy towards the development of bilateral relations with it, although with the modest results. Some achievements were gained in the transport sector, besides this, Ukraine got a promise for a supply of the Iranian oil. However, regardless of expectations, the breakthrough in the relations with Iran did not occur. In 2017, the Ukraine's cooperation with the People's Republic of China intensified. Discussions about possible Ukraine's participation in the One Belt One Road Initiative revived. Also, the Vice Prime Minister of the State Council of the PRC paid a visit to Ukraine, and the prospect for the economic cooperation was outlined. At the same time, a visa-free regime and the FTA between Ukraine and China remained open. In 2017, Ukraine and Lithuania intensified their bilateral cooperation. Lithuania supports Ukraine both in the bilateral relations and at the level of the European Union, being as unambiguous as possible in regard to the territorial integrity and sovereignty of Ukraine and the sanctions against Russia. In response to the Ukrainian government’s appeal, Lithuania provided its military (weapons that did not meet NATO standards), humanitarian and other assistance (Ukrainian soldiers’ rehabilitation, equipment). Lithuania was called an "advocate of the European aspirations of Ukraine", a "friend" and a "strategic partner", with all these status confirmed with the real actions. But, as in a previous year, the anti-corruption reforms remained to be the problem making Lithuania to criticize Ukraine within the European integration aspirations support. In 2017, bilateral relations intensified, while economic cooperation, a political dialogue and the 5+2 talks on the Transnistrian settlement significantly advanced. However, the level of institutional cooperation remains insufficient, and a pro-Russian position of the President of Moldova interferes with the Ukraine—Moldova dialogue at the highest level. In 2017 the relations between Ukraine and Poland were determined by an essential dichotomy: increase of the speed and scope of cooperation on all levels (security cooperation, support at international forums, energy industry, support for reforms and humanitarian aid), immense number of contacts in different formats and at the same time continued aggregation of conflict concerning historical policy. Bilateral relations kept their positive dynamics, first of all at the level of military and law enforcement agencies. Institutional cooperation was noticeably strengthened, allowing restoring of the intergovernmental commissions work. Given divisive issues of the language provisions of the Law of Ukraine "On Education" solved, one can expect further progress in the bilateral relations. Relations with Slovakia are not burdened by any problematic issue, which distinguishes this country from other Ukrainian partners in the Visegrad Four. Ukrainian diplomacy has yet to capitalize on this fact and an increasing authority of Slovakia in European processes. Despite favourable initial conditions, the cooperation is still suffering from lack of "major issues" on the bilateral agenda (with the exception of gas reverse) under the circumstances of fragmentary interest of the countries in each other. Analysis of the Turkish direction in Ukrainian foreign policy points to existing political interest in cooperation with Turkey and an adequate understanding of its role in contemporary international processes. Ukrainian-Turkish relations remain dynamic and cover a wide range of spheres - from economic to military and political. Yet, current activities lack strategic vision, the ties are often superficial and formal and the windows of opportunity are not used to the full potential. 2017 demonstrated how the lack of Ukraine's attention towards the cooperation with Hungary, could led to a serious crisis in their relations. Hungary continued its policy towards Ukraine, focusing on the Hungarian minority interests' uphold in the Transcarpathian region. In their turn, the Ukrainian officials failed to prevent and had to react to the crisis consequences. The main achievement of the Ukraine - Hungary relations was Hungary maintaining its official position regarding the preservation of sanctions against the Russian Federation, as well as facilitation of a visa-free regime launch between Ukraine and the EU. 2017 did not bring about any fundamental changes in the Ukraine-Russia political relations, hybrid aggression of the RF against Ukraine transformed into one of the dimensions of the Russian policy. Having found no influential political force in the Ukrainian politics, which would be capable of performing the political partnership function, the Russian authorities tried to apply delegitimation strategies to the Ukrainian state via support of ‘pro-Russian’ politicians in Western countries-partners of Ukraine. Bilateral interstate relations will remain at a critically low level, with no prospective changes at least over the medium term. Foreign policy related to economic cooperation with the RF in 2017 remains ambivalent. Ukraine’s actions, same as before, mainly responsive to financial and economic levers of influence by the RF. Despite of intensified confrontation, discriminatory policy and its negative effects, the RF remains the largest trade partner and keeps on playing an important role for Ukraine’s economy. In 2017 Ukraine did not import Russian gas because of ongoing hearings at Stockholm Arbitration and the possibility of buying enough gas from spot facilities in the EU. Transport blockade minimized supply of coal from the Russian Federation. There were technological cross flows of electric energy, and nuclear fuel supply continues to decrease along with technological cooperation. At the same time, dependence on fuel products import is increasing due to inaction in strategic stock creation, the influence of monopolists from the Opposition Block is increasing with the former advocating for expansion of cooperation with the Russian Federation. In cooperation with international partners, Ukraine managed to curb realization of Nord Stream 2 gas pipeline but the RF embarked upon implementation of Turkish Stream projects, which poses a threat oftransportation mode change for Russian gas, at least to the Balkans and Turkey. In 2017, the interaction of Ukraine with the Middle East region maintained the pace of the previous year, as evidenced by a number of visits to these countries, including official meetings on the highest levels and the agreements reached as their results. The best efforts were made in relations with Saudi Arabia, the UAE, Qatar, Kuwait, and Iraq. However, some decrease in political interest towards this region does not allow developing of the foreign policy strategy to reach a new level of relations. The political dimension of the interaction involves a wide range of the security issues and is mainly declarative. 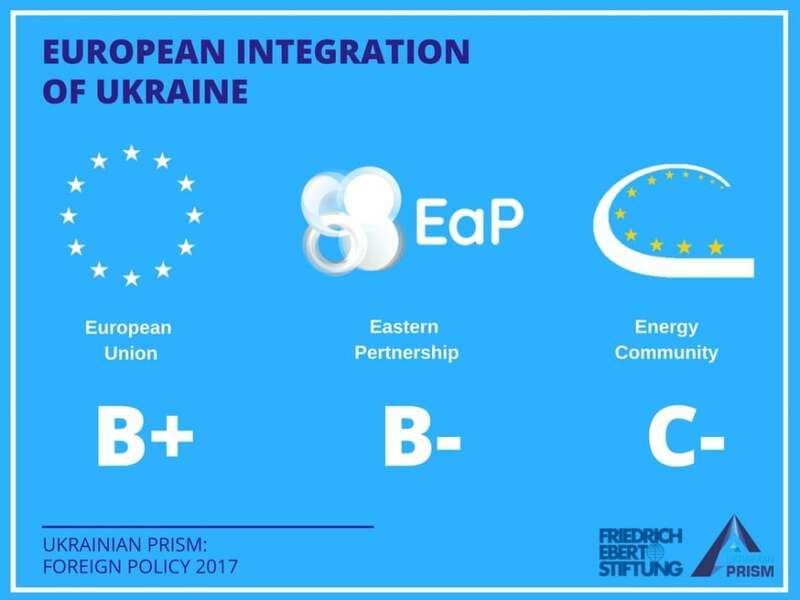 In 2017, the Ukraine's attention to the Western Balkans region was not elevated and remained differentiated, depending on the countries membership in the EU and NATO and their attitude towards Russia. The counteraction to the Russian aggression at the international level and the economic prospects became the key directions for the Ukraine’s cooperation with the countries of the region. A sufficiently large number of documents were signed and ratified, which create the basis for the further development of relationship. In 2017, the Ukraine's attention to the Baltic states increased, as evidenced by a number of the high-level meetings and communications exchanged by the heads of the states on Ukrainian reforms and conflict resolution in the East of the country. First of all, countries cooperated in military, humanitarian, and economic spheres. A lot of attention was paid to the Ukraine’s integration into the EU, including a visa-free regime and the AA ratification, as well as approval of the sanctions against the Russian Federation. Ukraine preferred focusing on the bilateral relations with each country rather than building comprehensive regional approach. Despite the noticeable intensification of the bilateral cooperation with the countries of the region in 2017, the Ukrainian interests in this region, the identification of the key partners and promising areas and activities in the area are still being realized very slowly. As in the previous years, the Latin America potential was underestimated by the Ukrainian authorities. This was seen both in the extremely slow growth of the Ukrainian export and in the country image losses (for example, for the second time, we can see no international support of Ukraine concerning counteraction to the Russian aggression by the ruling elites, in particular, in Argentina, Brazil, Mexico and Peru. It is evidenced by the preliminary results of the UN GA committee voting for the resolution “The situation of human rights in the Autonomous Republic of Crimea and the city of Sevastopol, Ukraine”, proposed this year by Ukraine). In 2017, Ukraine was more pragmatic about its cooperation with South Asian partners. In particular, we came to realize that we should not expect to engage these countries in active counteraction to Russian aggression. Instead, we should pay more attention to recreation of the image of Ukraine and economic cooperation. Cooperation with India and Bangladesh is focused on the development of mutually beneficial trade and economic cooperation, contacts in the sphere of education, tourism, military and technical cooperation. There has been certain progress in legal framework development for cooperation; individual contacts have become more frequent. At the same time, in 2017 there was virtually no cooperation with other countries of the region – Nepal, Bhutan, Sri Lanka and Pakistan. Top leaders of Ukraine are interested in expanding opportunities of cooperation with countries of Sub-Saharan Africa. Yet, the scope of measures implemented to strengthen Ukrainian positions in the region remains insufficient. African direction is beyond the focus of state documents of a strategic character as there is no consistent policy regarding this region. The basis for the bilateral relations is primarily trade and economic cooperation. Even though the volume of trade between Ukraine and African countries is increasing, it is still insufficient for the relations to move to the next level. Absence of the direct geographic access of Ukraine to the region, internal political and geopolitical agenda of the Central Asia countries and aggressive foreign policy of the Russian Federation against Ukraine keep on restraining Ukraine’s presence in Central Asia. So far, there is a trend to put on hold and further reduce cooperation in bilateral interstate relations of Ukraine with the countries of the region. In 2017, as well as a year before, the Black Sea region continued to be considered by all the foreign policy decision-making centers in Ukraine almost entirely in terms of the security. It is quite natural that in 2017 the realization of the Ukraine's foreign policy in the Black Sea region to a greater extent was connected with finding the solutions on the level above regional. First of all, this concerns the search for the non-regional mechanisms for confronting the Russian aggression. In the context of the long-term occupation of the Crimea and armed tensions in the East of the country, Ukraine focused on the further steps towards rapprochement with NATO and its members from the Black Sea countries, as well as on an attempt to closely cooperate with the BSEC, headed by Ukraine from July 1 to December 31, 2017. In 2017, the Ukraine—Visegrad Group cooperation was mainly based on the bilateral relations with its member states. The institutional cooperation took its course in various spheres, with a number of problematic issues, in particular, in the relations with Poland and Hungary that influenced the level of the regional cooperation with V4, where Warsaw and Budapest in 2017 held the rotating presidency one after another. However, the overall political support provided to Ukraine as a potentially new member, and a visa-free regime for the Ukrainian citizens remained unchanged, as well as the preservation of the EU sanctions against Russia. The second year of a non-permanent membership of Ukraine in the United Nations Security Council marked continuation of extensive work as to involvement of the UN in Ukrainian with internal problems (first of all, the deployment of peace-keeping mission), as well as regarding crisis situations resolution in other parts of the world. Ukraine managed to not only keep the Ukrainian question on the agenda of the UN institutions but also to achieve a positive result in approval of the important UNGA resolution on Crimea and UNSC resolution on protection of critical structure. Compared to 2016, the Ukraine's activity in the Council of Europe was not proactive but rather responding to the problem issues (for example, to the consequences of the Law "On Education" adoption, used by some neighbouring countries as a bilateral relations trigger). At the same time, due to the consolidated position of the Ukrainian delegation, during the spring session of the PACE it became possible to intensify discussions about the PA leaders’ abuse of powers and changes to the institution rules, that could be considered as a proactive approach. The Council of Europe 2015-2017 Action Plan for Ukraine was realised as planned. In 2017, cooperation between Ukraine and the OSCE was marked with a high level of contacts, visits and interactions with the key OSCE institutions. After appointment of the new Secretary General, the High Commissioner on National Minorities (HCNM), the Representative on Freedom of the Media, and the ODIHR Director, they paid their visits to Ukraine. Same as previous years before, there was a high level of the bilateral cooperation realized by means of the Special Monitoring Mission (SMM) activities, and the Ukrainian representatives taking part in the Trilateral contact group on conflict resolution in the Donbas area. Due to the reasons beyond the Ukraine’s control, the OSCE SMM could not complete its mandate in full, and monitor Ukraine - Russia borderline and the temporarily occupied Crimea. The OSCE was actively used as a political platform for the talks on the Russian aggression against Ukraine and consolidation around the issues of providing support to Ukraine. In 2017, Ukraine intensified its environmental efforts and managed to fulfil part of its commitments under the Association Agreement and international conventions. The Law On Environmental Impact Assessment became effective in December. It is supposed to become an instrument for preventing environmental harm during implementation of new large-scale projects. The government approved Single Registry of Environmental Impact Assessment, the Concept and the Action Plan of Climate Change State Policy Implementation 2030. Ministry of Ecology is designing a Low Carbon Development Strategy to implement Paris Climate Agreement. A number of laws that are to be passed in energy sector will have a direct impact on reduction of greenhouse gas emissions and the contribution of Ukraine into fight with climate change. At the same time, in 2017, Ukraine did not use opportunities of finding and attracting environmental (green) investments from global financial market, and relevant interagency working groups in the Ministry of Ecology and State Agency on Energy Efficiency and Energy Saving of Ukraine were mostly working with domestic market with respect to Kyoto Protocol and environmental tax for industry. 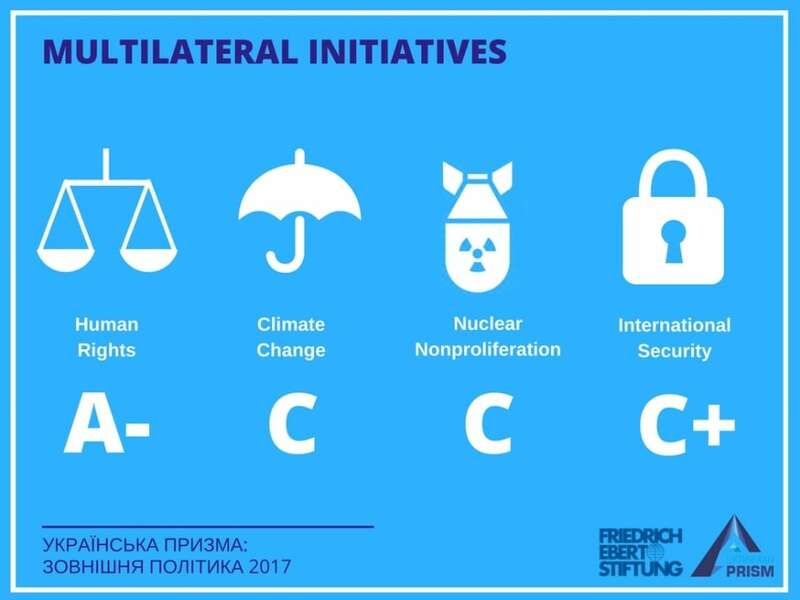 In 2017, Ukraine’s foreign policy in the sphere of nuclear non-proliferation did not undergo any changes. Ukraine kept on performing international commitments undertaken within the non-proliferation regime. Special attention was paid to the issues of export control and security guarantee mechanism’s enhancement. In 2017, Ukraine de facto kept on focusing its activity related to international security on its activities as a non-permanent member of the UN Security Council. Promises to increase Ukrainian participation in the peace operations under the auspices of the UN and NATO, given previous year, were not fulfilled. The number of women participating in such operations decreased. Conflicts on the African continent, in Transnistria and North Korea stayed almost the only topics of political interest in the field of international security. 2017 was in fact a revolutionary year in terms of institutionalization of public diplomacy and approval of necessary regulations, including of the strategic character. Information Security Doctrine of Ukraine and Action Plan for Implementation of the Concept of Promoting Ukraine in the World and Promoting the Interests of Ukraine in World Media have been passed, the decision on establishing Ukrainian Institute has been made. Department of Public Diplomacy of the MFA was particularly active and efficient in 2017. It initiated launch and further implemented almost 200 different projects in the sphere of public and cultural diplomacy. At the same time, lack of proper state funding for this sphere traditionally remained a problem. Ukraine’s attention to the Ukrainians abroad has somewhat increased in the context of the foreign aggression and declared intention to develop towards the European integration, which fact is proven by the meetings of the country’s authorities with the representatives of the Ukrainian diaspora, as well as by the approval of the State Program of Cooperation with Ukrainians Abroad for 2017-2020 by the Government. Development of stable effective communications with Ukrainian diaspora and the use of its potential for the sake of popularizing Ukraine and Ukrainians, promoting their interests in the world are a core of in this sphere. However, so far, there is no wide political interest in cooperation with Ukrainians worldwide, and this issue is mainly outlined generally within the list of many other tasks, that does not allow separating this direction as a priority one.